In the years following the Civil War, Cobourg Ontario, a community nestled on the shores of Lake Ontario, emerged as one of the most popular resort communities in North America. Families from the southern United States found a summer respite in a cool and hospitable climate without needing to spend their money in the northern United States. Somewhat surprisingly, at the same time, wealthy families from the northern United States--including Pennsylvania--also began summer pilgrimages to Cobourg. The northerners were attracted to the Cobourg area's reputedly high quality ozone and for various business-related reasons. A number of the seasonal Cobourg residents later constructed large mansions throughout the town and its environs. 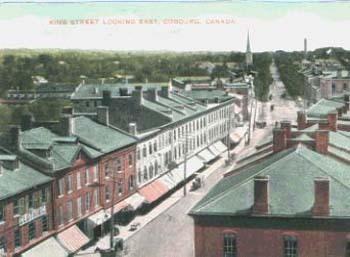 Indeed, Cobourg would remain a popular destination for both southern and northern families alike until the early years of the twentieth century. Drawing upon an array of primary and secondary sources, this project examines Cobourg's summer populace during the period 1865-1930s. Specifically, the project addresses the following questions: 1) What specific factors contributed to Cobourg's popularity with both southern and northern families? 2) What types of economic and social relationships existed between northern and southern families living in Cobourg? 3) What types of economic and social relationships existed between the American families and Cobourg's permanent Canadian residents? and lastly, 4) What factors contributed to Cobourg's loss of favor as a summer residence for the Americans? Despite Cobourg's popularity with wealthy Americans, it faced major competition from other resorts in Ontario, especially in the Muskoka District. Like Cobourg, Muskoka boasted a large U.S. summer colony which included many prominent families from Pennsylvania and elsewhere. Consequently, the Cobourg project has been recently expanded to examine the rival Muskoka summer colony and its similarities/differences to its Cobourg counterpart. Bibliographic information for all primary and secondary sources as well as other resources related to Cobourg's American summer colony and its denizens--and to a lesser extent Muskoka's colony and its denizens--located during the project are being made publicly available on this site. The site is intended to serve as a research portal for individuals in the United States, Canada, and throughout the world who are interested in learning more about the topic. Additional resources will be placed on the site as the project continues. On a final note, while every attempt is made to ensure the accuracy of the information provided, errors may still occur. If you believe any information provided on this site is incorrect, please contact the site's administrator, Marsha Ann Tate. § “Of Iron and Ozone: The History of the American Summer Colony in Cobourg, Ontario.” Bookend Seminar Series presentation given at Juniata College, Huntingdon, PA, October 2012. The full text of the presentation was published in Juniata Voices, Vol. 13 (2013). § “I am Sir, Your Obedient Servant: U.S. Consular Activities in Port Hope and Rat Portage, Ontario, During the Late 1800s and Early 1900s.” Paper presented at the 2011 Biennial Conference of the Association for Canadian Studies in the United States (ACSUS), Ottawa, ON, November 2011. § “After the War: The Emergence of Cobourg, Ontario, as a Summer Resort Destination for Civil War Veterans during the Late Nineteenth Century.” Presentation given at the Pennsylvania Canadian Studies Consortium, 2011 Meeting, East Stroudsburg University, April 2011. § “Our Men in Canada: The Formal and Informal Functions of U.S. Consular Offices and Agents in Ontario during the Early 1900s.” Paper presented at the Biennial Conference of the Middle Atlantic and New England Council for Canadian Studies (MANECCS), Arlington, VA, October 2008. I would like to thank the Cobourg & District Historical Society, the Cobourg Public Library, the Archives of Ontario, the Pennsylvania Canadian Studies Consortium, and the citizens of Cobourg and the Lake Muskoka region for their assistance with this project. Page created 18 May 2005. Last updated 05 July 2014.